Happy Holidays! Whichever holiday you celebrate, may you enjoy time with family during this special time of the year. I am still preparing for Christmas and have a list of yummy sweets that I hope to prepare and enjoy during time with family. Today, I’d like to share two simple recipes that my family loves to snack on. The first recipe is for Muddy Buddies. All though it’s a very simple recipe to follow, I’m not very good at preparing this delicious mix. Fortunately, Paige and Hannah are experts so I always leave it to them! Into large bowl, measure cereal and set aside. In 1 quart microwavable bowl, microwave chocolate chips, peanut butter and butter uncovered on High for 1 minute; stir. Microwave about 30 seconds longer or until mixture can be stirred smooth. Stir in vanilla. Pour mixture over cereal, stirring until evenly coated. Pour into 2 gallon resealable food-storage plastic bag. Add powdered sugar. Seal bag; shake until well coated. Spread on waxed paper to cool. Store in airtight container in refrigerator. You can add red and green M&Ms for a festive twist. Warning—you may want to double the recipe as this always disappears quickly! For the next recipe, I hope you like peanuts! My son JP always make this Peanut Brittle during the holiday season. This is a recipe from the Betty Crocker cookbook and a favorite of many candy lovers. This recipe takes patience, but is well worth it! Heat oven to 200°F. Butter 2 cookie sheets, 15.5x12 inches, and keep warm in oven. Mix baking soda, 1 teaspoon water and the vanilla; reserve. Mix sugar, 1 cup water and the corn syrup in 3 quart saucepan—I always butter the sides of my saucepan before beginning this step. Cook over medium heat with occasional stirring until the temperature reaches approximately 240°F (soft ball stage) on the candy thermometer or until small amount of syrup dropped into very cold water forms a soft ball that flattens when removed from water. Stir in butter and peanuts. Cook, stirring constantly, to approximately 300°F (hard crack stage) or until small amount of mixture dropped into very cold water separates into hard, brittle threads. (Watch carefully so mixture does not burn.) When the mixture comes to 300°F, immediately remove from heat. Quickly stir in baking soda mixture until light and foamy. 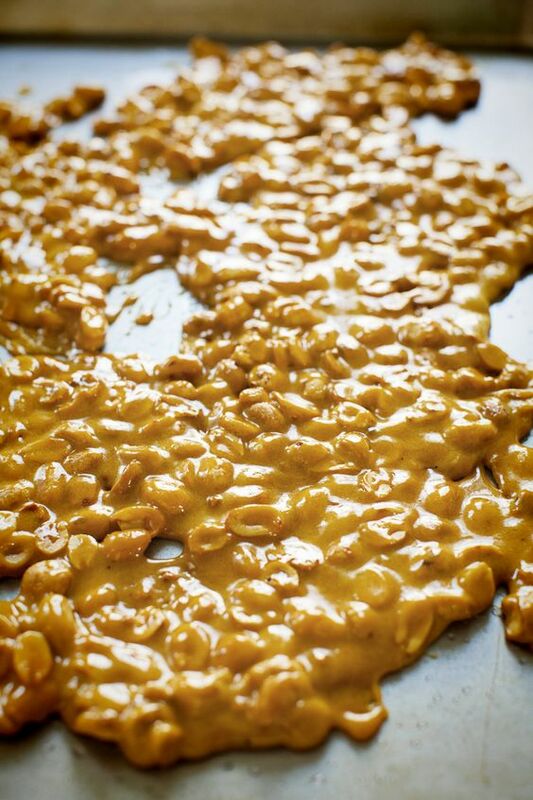 Pour half the candy mixture onto each warm, buttered cookie sheet; quickly spread mixture to about 1/4 inch thick. You may spread the hot mixture with a warm buttered spatula. At our home we use buttered forks to pull the brittle. Cool completely, at least 1 hour. Break into pieces. Store in covered container. I hope you find the time to make some sweets for your family and friends this holiday season. I’d love for you to share a family recipe that you enjoy this time of the year with us. One can never have too many recipes! Share on the TU living Facebook (@TUliving.Kathy) or Instagram and Twitter (@TU_living).